the sBark | Head-Lites Pet Products Inc.
Gail and her service dog Tyrell were one of our very first canine vision teams we were honoured to light up with Head-Lites. It was with great sadness we had learned of Tyrell's cancer diagnosis in the spring of 2015 and his unfortunate passing shortly thereafter. For seven years Tyrell safely guided a completely blind Gail around the city of Vernon, B.C. A service dog had enabled her to live independantly day to day and just very recently Gail opened her heart up to a new friend. We had the pleasure of meeting up with Gail at the Lions Foundation Dog Guides training center in Oakville, Ontario. She was matched with a flat coated retriever named Merry and working with trainers to bond with her new service dog. I had asked Gail what it was like first meeting Merry and she shared a story with me. Merry's foster mother was present one day and the dog started jumping with excitement, reason unknown to Gail until the foster mother introduced herself. She had affectionately addressed Gail's new friend as "my Merry". Gail confided that her heart had sank wondering if her new friend would ever be "her Merry" and love her the same way she loved her foster mother. As a foster family, it is an incredibly bitter sweet moment when the dog you've raised in your home from the age of 7 weeks old must leave you for their bigger purpose in life. Volunteer foster families give the most important start in a puppy's path to becoming a service dog. The time spent at the training center together really becomes the key enabler to build up trust between the new handler and dog team. A calm and placid Merry lay at Gail's feet as we chatted, clear that a special bond had cemented between the two. I then asked Gail when Merry had became "hers". She described sitting quietly in her room and just whispering Merry's name, and within a few paw pads, Merry was right at her side. She shared with me how the beautiful dog knew right away she was blind and had adapted her behaviour to meet Gail's needs. For example, their play time is a version of Marco Polo where Merry would utter a low play growl to let Gail know where she was so they could tug a toy together. If the game of the day was hide and seek, Merry would level the playing field with vocal cues to guide Gail around to her hiding spot. As playful as Merry is - when the working harness came on, it was all cool and calm business with Gail's safety first and foremost. We wish Gail and all of her other canine vision classmates who graduated this past week all the best as they head off to their respective homes across Canada with their new life companions! The Lions Foundation of Canada Dog Guides makes it possible for folks like Gail to receive a service dog free of charge all thanks to generous fundraising and donation efforts. It costs on average $25,000 per dog and countless hours of training and volunteer efforts. Here are some great ways you can help! Dogs are our way of life. The trail between home and the grocery store is covered with snow and flanked on two sides with trees. There are no street lights or lane markers, just one pathway shared by snowmobiles and dog sleds alike. It takes 5 hours each way to make the monthly food run. Welcome to the Alaskan wilderness. Heidi Sutter of KMA Kennel of Christochina, Alaska shares her home with her husband Darrin Lee and 18 huskies. While both Darrin and Heidi competitively participate (and win) in long distance racing with their teams, these furry companions also play an important role in other aspects of their lives. Hailing from originally from Wiscasset, Maine, Heidi is a school teacher specializing in children with emotional disturbance, autism, as well as severe behavior disabilities. Working towards her Board Certified Behavior Analysis accreditation (BCBA), a special education teacher in this remote community serves as a jack of all trades offering various forms of therapy along with preparing meals throughout the day with food that has been donated. Often these meals are the only meals that the children will have access to. In Canada, we joke about having Halloween costumes that are parka friendly. Heidi and her daughter Emily, when she was younger, took it a step further by trick or treating via dog sled as their neighbors were located in a 20 mile radius. What a fantastic way to offload your candy as you went to the next house! The dogs also serve as their mode of transportation from point A to point B and also hauling power to bring life sustaining firewood back to the homestead. As a mentor to junior mushers, Heidi is currently passing on her knowledge of mushing to the next generation of racing enthusiasts. What we might imagine as transferring race tactics is actually just a sliver of what is shared – the bulk of being a real musher is proper care of the dogs on and off the trail and also wilderness survival and camping together with your dog team. Head-Lites is proud to light up Heidi Sutter and KMA Kennel in their journeys together on the home trails and the race trails. We’re also incredibly enlightened by the amazing partnerships we learned about between the dogs and humans up north. He’s no stranger to the spot light. His pug mug has graced the silver screen multiple times, his co-stars include a number of Canadian acting icons, and he even has an IMDb profile page. Igor (pronounced Eye-Gore) PugDog is a Canadian canine celebrity hailing from London, Ontario. Owner, handler, and manager Tracey Silverthorn noticed a special spark in Igor early on. She and her husband Sean nurtured his gentle nature from bringing a smile to one person to becoming an entertainer with an international audience of millions. From answering a simple casting call for a local rescue organization, Igor’s climb to fame has been a steady one with his most noted performance in the award winning short film with Gordon Pinsent, Life Doesn’t Frighten Me. There’s a great promo clip of the two stars on YouTube when the film was aired for CBC's Short Film Face Off. But this little guy doesn’t let any of this stardom get to his head. In fact, he uses it for doing good in the community. Igor and Tracey began (and still continue) their journey together as a St. John Ambulance Therapy Dog team. His growing popularity adds a powerful touch to his therapy tool kit when he is visiting local hospitals, shelters, schools and libraries. What began as a little pug visiting weekly turned into a positive self-propelling story that his special friends can follow along. This is also the 2nd year that Tracey and Igor have put together a fundraising calendar called “Bad to the Bone” where all proceeds are donated to support Pugalug Pug Rescue. You can show your support by purchasing Igor's 2014 Bad to the Bone Calendar online, which makes a fantastic Christmas gift. Follow along on all of Igor’s adventures on his Facebook Page and Twitter Feed (we all do here at Head-Lites!). We’re thrilled to have the opportunity to shine a little light on this team, who’s future and philanthropy only keep glowing brighter. We wanted to take a moment to share with you why we chose to support Search and Rescue Dogs Ontario. SAR Dogs Ontario is a composed of four dedicated volunteer civilian handlers and K-9 partners who work and train alongside Ontario Police search and rescue teams. When we first started Head-Lites, we wanted to test out the functionality of our design beyond the dog parks and were very welcomed by SAR Dogs Ontario to shadow a number of their training runs. It was an eye opening experience to learn about what they do, why they do it, and how they do it all on their own time and finances. They are deployed in missing person cases and are called at a moment’s notice to support and replenish low resourced police search operations. In addition to obtaining various certifications, the teams are out training twice a week for 6 to 8 at a time to maintain their certifications. Why do they do it? They love working with their dogs and for the simple altruistic desire of using that K-9 bond and partnership to help others. We often don’t hear about these volunteers until someone goes missing. We’re humbled that we can support them and also give them a product that helps them perform their jobs better. Dave Walker, Hetty Abma, Ray Lau, Marianne Ivancsics and your K-9 partners, we thank you for all that you do in our community. Visit Search and Rescue Dogs Ontario to find out more about how you can help. Photos courtesy of Search and Rescue Dogs Ontario and Head-Lites Pet Products Inc.
Hope, one pixel at a time. The saying “a picture is worth a thousand words” holds a different kind of weight today in the age of the internet compared to its humble origin in newspaper journalism. What we skim through or send virally with a mouse click is only given a few seconds of our attention. We shop online for clothes, groceries, and even for our next forever furry friend. When you peruse the current tenants list on your local animal shelter’s website, will their photographs reel you in for a face to face visit? We’d like you to meet Stacey Morrison, pet photographer from Burlington, Ontario. Her career as a pet photographer began with her own personal adoption of an adult Golden Retriever named Chloe. Photographs of Chloe slowly expanded to portraits of pets of friends and from there, Stacey’s passion and talent bloomed to become Happy Tails Pet Photography. Looking through her online portfolio, each photograph has a striking way of telling the story of a human-animal bond along with a sense of the animal’s unique personality. Animal welfare is a cause close to Stacey’s heart and when she learned of photographers volunteering at local shelters in the United States, she was immediately inspired to volunteer her own skills to make a difference. Stacey has worked extensively with the Burlington Human Society, Canadian Dachshund Rescue, Ontario, and the Milton Animal Sanctuary. Photographing animals in a shelter environment is extremely difficult as the animals are usually timid and frightened and the lighting is dark. This photographer begins her sessions by taking each animal out of its current environment. The dogs run and play in the grass, and the cats explore the rooms outside of their cages. The end products from these sessions speak volumes: the natural photographs that Stacey captures brings out each animals true personality, something that cannot be conveyed through a snap shot taken behind bars. Stacey is also a member of a non-profit organization called HeARTs Speak, which is a group of artists (photographers, graphic designers, etc…) devoted to helping animals in need. There are many ways we can help too and Stacey has shown us that even giving a bit of ourselves can change the life of one animal, one pixel at a time. 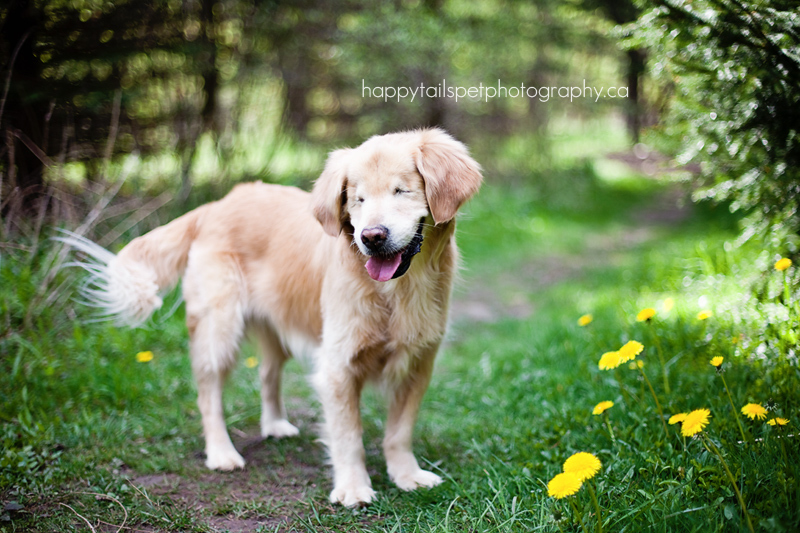 You can view Stacey’s work on her website where she accompanies each photography session with a beautiful write up: http://happytailspetphotography.ca/ and also follow along on her Facebook Page. All photographs used in this article are courtesy Stacey Morrison. If there is a will, there is a way. Deanna Bliuvas is no stranger to that phrase; in fact, she embodies the very essence of it. This Toronto native, who now calls the Ottawa area her home, has been a longtime advocate for animal welfare and rescue. Her own pack of rescues consists of two cats (Watson and Sherlock), and lucky dogs Minnie II, BB, and Kermit. Canadian Guide Dogs for the Blind, Friendly Giants Dog Rescue, NOLA Lab Rescue, Save My Tail and IFAW are just a handful of the organizations lucky enough to have had her on their team. It was one particular rescue endeavor in Quebec that firmly set in motion a chain of events that leads us to Deanna today: a founding member of Operation Sled Dogs and the Senior Transport Coordinator and Board Member for Pilots N Paws Canada. To set the scene: a cold winter in Quebec, a sled dog operation in trouble and huskies with an unthinkable end awaiting them. Enter Deanna and a group of dedicated volunteers, and a lady by the name of Gini Green. Add two weeks, $10000, 4 provinces, and you get 25 lives saved. Gini looked at all the efforts undertaken by Deanna during this rescue and realized a network for air transport needed to be built in Canada. Modeled from the best practice of the US based Pilots and Paws, Gini launched Pilots N Paws Canada in June 2012 with Deanna as one of her most valued co-pilots. “An awesome rescue advocate, a passionate and caring individual and a great friend”. It begins with a phone call from a rescue organization requiring help to move an animal in their care. Deanna springs into action gathering all the necessary information and mobilizing her Canada-wide network of volunteers with Pilots N Paws Canada. As a senior transport coordinator with PNPC, she is the pivot point for all the logistics and volunteers involved in the intensive operation of rescue transport. Often times each transport requires problem solving and trouble shooting on the fly as conditions change in a blink of an eye. Deanna has even opened her home up multiple times to fostering animals enroute to their next destination. Pilots N Paws Canada works with rescue and shelter organizations across Canada, to move animals at risk and in over-burdened environments, to other parts of Canada where their chances for adoption are greater and loving homes await them. “I do it for the Canadian animals in need. It is all about the animals. When Pilots N Paws Canada launched, I knew I wanted to be a part of it ~ having been involved with transporting rescued dogs, by volunteer drivers, I had first-hand knowledge of the challenges in moving animals to the rescue organizations that could save their lives”. It is all thanks to tireless volunteers like Deanna that animal rescue is made possible in Canada. Through her ongoing endeavors, she teaches us that every little bit of help we can give makes a difference, no matter how big or small the contribution. Thank you to Gini Green and Deanna Bliuvas for the photos used in this article. Head-Lites is pleased to be supporting Pilots N Paws Canada in their fundraising efforts to continue to transport animals to their forever homes across Canada. You can help by purchasing the PNPC collar where proceeds are donated to Pilots N Paws Canada. You can find the collars this weekend in the Pilots N Paws Canada Booth at Blessfest! I'll see your smile, and raise you a hug. If you’re in the Greater Toronto Area (GTA), you may already know this celebrity team. They’ve graced the pages of the local newspaper, magazine, and also shared the stage with Cesar Millan. Their evolving story and partnership has been shared a number of times but it's a real life story that can always be shared again and again, and of course we wanted to share Smiley with you too! Over 8 years ago, Joanne George was at a puppy mill that the SPCA was investigating where she and a veterinarian vaccinated, spayed and neutered, rescued and re-homed 15 of the dogs there. Among the group was a dog that was given the name Smiley. Joanne knew this little guy needed a very special home and in the end, that special home turned out to be hers. Already at least a year old when he was found, Smiley was born without eyes and that predisposed him to many behavioral issues. It took a lot of love and guidance from Joanne, who is a dog trainer (www.trainingthek9way.com) and her late Great Dane, Tyler, to teach Smiley how to be a regular dog leading a regular pet life. In turn, Smiley gave back to Joanne in ways she could never have imagined. Within a year of Smiley acclimatizing to his new home, Joanne began to notice how Smiley touched everyone he met and she realized Smiley should be shared with as many people as possible. His happy go-lucky disposition charms his friends and taught Joanne the power of patience and sensitivities of her energy level around him. How she tunes herself to Smiley has translated into her own easy going demeanor in her own life. Smiley joined the St. John Ambulance (SJA) Therapy Dog program in May of 2010 and the partnership between Joanne and Smiley was something to behold by all who meet them. The blind dog walks with Joanne trusting in her guidance through purely her voice and energy. He embodies the essence of dealing with the card life dealt him and moving on with it positively, or should I say, pawsitively. This team’s inspirational story inspires others – in fact, it was Smiley and Joanne who inspired Head-Lites dog Piper to join the SJA program as well! Milton based photographer Stacey Morrison captures the beauty of Smiley and his bond with Joanne and her son, Shepherd, in this wonderful series of images on her Happy Tails Pet Photography Blog. The world smiles with you Smiley, thanks for lighting a sBark in us. Check out Smiley's new Facebook Page! Thank yous to Joanne George and Happy Tails Pet Photography for the use of their photos in this article. To Live, Smile, and Run. Take one look at Ellie and her forever friend Jessica – and be prepared to experience 1) the fresh power of the age old partnership bond between human and animal and 2) the loving force of a small community strong. Kelowna, B.C. native Jessica Littleford will be the first to tell you that her world changed in October 2012 when she joined her sister and Paws It Forward Dog Rescue to make a difference for the life of one little dog. Born in a puppy mill, Ellie’s spine was malformed in the middle to lower region giving rise to neurological issues. Mobility was incredibly limited save for some motion in her forearms to drag her delicate body across the ground for survival. From the moment Jessica met Ellie, an inseparable bond formed between the two, with an unspoken commitment to each other. The discovery of Ellie’s tenacity for movement began with something as simple as Jessica fashioning a cloth diaper to prevent further injury and pain to her chafed underbelly. As she gained muscle tone and body weight under careful love and nurtured play, Ellie began to support herself enough to manage a handful of miracle steps. With the introduction of a canine designed wheel chair, the world exploded for Ellie. The little paraplegic husky puppy then began a parallel adventure with her human companion. Jessica and Ellie regularly join together with Paws It Forward Dog Rescue in local events to promote and bring awareness to adoption and animal welfare. While Ellie may represent one end of the spectrum of animals in need of our help, she is a beacon of hope for all, showing courage to live, to smile, and now, to run. Wherever Ellie is, she leaves an impression in your heart and her positive nature has gained notoriety with all those she meets. Curiosities in spontaneous synapses in Ellie’s back end (such as random tail wagging) presented a mystery and opportunity to veterinarians and Jessica began to seek solutions and answers for Ellie. Medical expenses for Ellie’s neurological condition are not inexpensive and Jessica began humble efforts to fundraise within the community. What happened next began a cascade of support in the small community of Kelowna for the little dog that could. Norm and Tasha Melnichuk of Bark ‘n Fly Dog Daycare and Boarding spearheaded an online auction for Ellie that drew in donations from businesses and individuals all over town. It even caught the attention of some of us in Ontario! When all was said and done in June, they raised over $5000 to help this little husky continue to move her way through people’s hearts. As Jessica is pursuing her Masters in Social Work at the University of British Columbia Okanagan (UBCO), fate had it that she would shortly meet professor Ty Binfet and his dog Frances. Dr. Binfet is the director of the BARK Program at the university. BARK is designed to meet the socio-emotional needs of students on campus through their coupling with therapy dogs– this fall Ellie will become a part of the team at BARK. Lucky students. Thanks to Jessica Littleford, Geoff Lang Photography, Bark 'n Fly, and Blissful Visions Photography for providing the images in this article. What are you sBarking about? Throughout our journey with Head-Lites, we have met some of the most amazing people and their dogs and we wanted to find a way to share their stories with others. Each encounter leaves us inspired, thoughtful, humbled - and lights a spark within us. And so came forth this column, blog, digital rambling, that we'd like to call "the sBark". We hope you enjoy reading the sBark and if you know of someone you'd like to share with us, please send us an email to info@head-lites.com. The sBark's awesome logo was created by the talented Kateh Mayman of London, Ontario, Canada. Pretty cool eh?